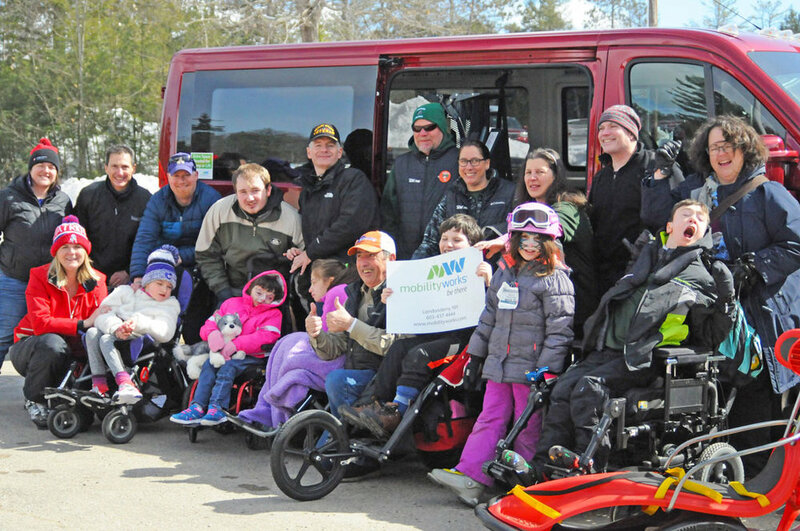 East Madison, NH (March 20, 2018) - Cynthia's Challenge, a 24-hour Ski-A-Thon, took place Friday, March 16 through Saturday, March 17 reached the goal of raising $65,000. Over 300 skiers and snowboarders from near and afar registered and participated in the 24-hour event held at King Pine Ski Area. Atlas Fireworks and Bank of New Hampshire provided a spectacular fireworks show Friday night and key support was provided by Vertical Challenge and Bolt Depot with crews DJ’ing music, staffing a photobooth and providing entertainment throughout the event. In its fifth year, Cynthia's Challenge has now raised over $246,000 to fulfill the needs of children including a service dog for Cynthia Verrill and handicap accessible vans for Sammy Gillard, Kevin Dall, Faith Holt, and now one to be purchased for Jacques Villeneuve’s family. Jacques is the son of King Pine staff member, Lucie Villeneuve, son of Peter Villeneuve and brother of 7-year old Melanie, all of Freedom, NH. The $65,000 raised will help cover the cost of a van and expenses associated with the challenge. Saturday's lunch sponsored by the Yankee Smokehouse provided grilled items served under sunny blue skies and nourishment for participants to finish the 24-hour challenge. In addition to lunch, The Yankee Smokehouse donated $2,250 raised by their successful pizza fundraiser hosted the Wednesday prior to the event. Thrivent Financial set up a waffle tent and raised $1,450. Flatbread Pizza provided pizzas for Friday night’s dinner and Leavitt’s Bakery along with Big Dave’s Bagels provided breakfast carbs to keep everyone going Saturday morning. Cynthia's Challenge would like to recognize the following businesses for their major support: Atlas Fireworks, Bank of New Hampshire, Bolt Depot, Boston Sand & Gravel, Bradley's Hardware, Centerplate, Danforth Bay Camping & RV Resort, Flatbread Pizza, Granite State Adaptive, King Pine Ski Area, Mad Cow Screen Print, Outdoor ESCAPES New Hampshire, Margie MacDonald-Remax Presidential, Pepsi, Purity Spring Resort, Ride-Away, Story Land, Thrivent Financial, Vertical Challenge and Yankee Smokehouse. A special thanks to everyone that donated raffle prizes, silent auction prizes and food to make this event possible including: A Second Glance Hair Salon, Bear Notch Ski Touring, Big Dave's Bagels, Blue Bay Seafood and Steak, Boston Celtics, Boston Duck Tour, Boyle’s Family Market, Chris Bloom, Broker Associate of Re/Max Presidential in North Conway, Corner House Inn, Eastman Golf Links, Eastern Mountain Sports, Farm to Table Market, Franconia Inn, Hobbs Tavern, Indian Mound-River's Edge Grill and Tavern, Jackson XC, Jake’s Seafood & Grill, J.P. Goodwin, Kahuna Laguna, King Pine Ice House, Lindt Chocolate, Loon Mountain Resort, Lost River Gorge and Boulder Cave/White Mountain Attractions, Monkey Trunks, Mountain View Station Restaurant, Mt. Washington Auto Road/Great Glen Trails, Mystery NH, New England Aquarium, North Conway Country Club, Omni Mount Washington Resort, Pat’s Peak Ski Area, Province Lake Restaurant, Reliable Oil Company, Santa's Village, Sap House Meadery, Settler’s Green, SkiNH, Ski Works, Skydive New England, Story Land, Synergy Sportswear North Conway, Wilson W. Stewart Artist and Windy Field Farms.